The budget cuts by NASA in the last number of years have covered a gamut that is destined to change the U.S. position in space exploration. From the retirement of the space shuttle to the removable of the funded educational outreach programs, NASA has become little more than a scientific base with a wonderful history in space. However, glass-half-full people can rejoice in the fact that this shift in policy and attitude has actually opened the doors to private business. For the first time, the geniuses of our time are establishing companies with a focus on the future in space through reusable rockets. One of the rising stars in the private sector for the future in space is SpaceX. The visionary ideas of the SpaceX CEO, Alan Musk (founder of the company, PayPal® and CEO of Tesla Motors®), has included the design and implementation of an experimental rocket called Grasshopper. This rocket is ten stories high and has docking at the International Space Station. The main focus of SpaceX is to provide Grasshopper as a method to propel space craft from the atmosphere of the earth, turn around and land on the launch pad. 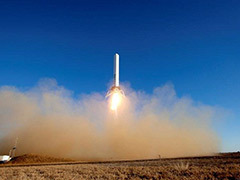 Musk has indicated that the current model of single-use booster rockets for space travel will not survive. In our society, almost everything is reusable, with a big exception of space rockets. The future in space for commercial ventures relies on reusable rockets, which creates lower costs, making a space launch one hundred times cheaper. This correlates to reducing the price to around 1% of existing price to launch a rocket. The testing process for the SpaceX Dragon mission has involved working with a number of agencies including NASA, to launch from the Florida based Cape Canaveral and California’s Vandenberg Air Force base. Since all are government institutions, it’s required some rather fancy negotiations with the U.S. government. As with all of the other space agencies around the world, the initial tests created nail-biting moments with emergency programmers sending new code to make adjustments when three out of four thruster pads experienced a malfunction. Those that have worked within the NASA realm know all too well what Musk and his team are going through. The first test allowed the take off, hovering and then turn around and landing at the same take off spot. The attending crowds cheered as they listened to the Johnny Cash soundtrack of “Ring of Fire”. The optimistic plans for commercial space flight doesn’t stop with just working with U.S. government space organizations. Musk is meeting with State of Texas lawmakers to coordinate the potential construction of a site for commercial launches in that state. We are in the beginning stages of commercial space flight and this can be compared to the first companies that started the industrial revolution all the way to those that saw the business benefits of the internet. Every technological era brings its challenges, which usually falls on expertise, talent and incredible dollar investments. As with any business venture, this requires a risk taker at the helm and Musk has proven his credibility and commitment to his ventures with a history of success. Why You Need to Conserve Water? Posted on May 10th under Renewable Energy Sources. All I can say is – it’s about time. It’s sad that it took private industry to take this idea to the next level. Government officials can’t seem to get beyond big bulk buying without any conscious effort of reusing. It’s just not in their thought process. The closest thing we got to that was the space shuttle. Has anyone told Ed Begley and Bill Nye, the Science Guy about this? I would love to see a television show on it, especially if the two of them team up to work with SpaceX . It would have been wonderful if the space budget would have included this, but sadly, they have cut that down to a bare minimum. Has anyone let them know that we have limited time on this planet? Our sun will burn out and we will be colliding with another galaxy. If we are to survive, locating another planet is the only answer. Our future depends on space travel and doing it the smart way seems to be the direction that this company is taking. I look forward to seeing other industries do the same thing. Who knows, maybe the idea of reusing will help them clean up the space junk we have left out there.